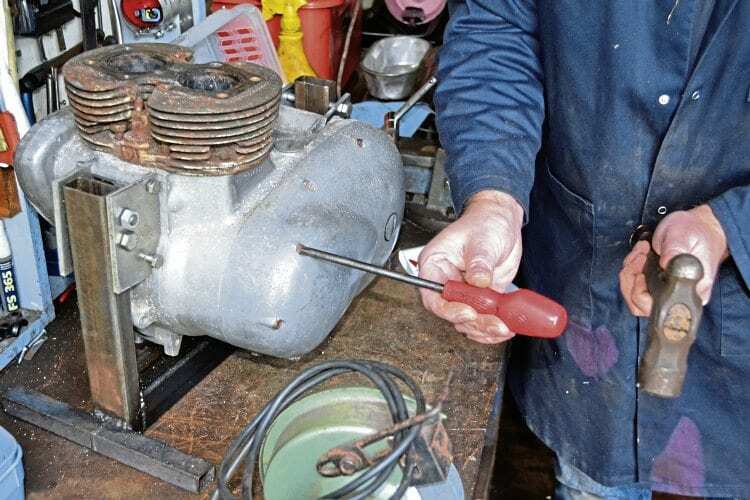 Some considerable time ago, Tim Britton delved into a 3TA Triumph engine that had been lying around the place for years… and following a casual comment from editor Pete Kelly recently, Tim has kindly agreed to pick up where he left off. Photos by Fiona Watson. Some readers might recall seeing a few of the accompanying pictures before, but in order to set the scene again we thought a little overview of the project – which now has the rather grand title of ‘Project 90’ – might be the most appropriate way to reintroduce the feature. This is the first of many tips we can offer: if a screw is seized then a light tap with a hammer on the end of a screwdriver, as shown here, will often be enough to free it off – our impact driver had bits bigger and smaller, but not the right size. We’ve all got bits and pieces of bikes picked up over the years, and they’re tucked away in boxes or shoved under benches or any amount of other storage places. Some come under the heading of ‘valuable spares’ while other bits are kept because none of us likes throwing things away. In the latter category I have a box of broken, bent and twisted Triumph parts which could never be used for anything other than a paperweight or to serve as a reminder when I should do maintenance, but it’s the former category that’s of interest to us here. at the right time and was offered a 3TA engine fort not a lot of money. BSA forks, plus a Triumph QD rear hub spare. So, all of a sudden there was potential to build something from the bits… except that engine went onto the shelf and was left for quite a long time while a Can-Am enduro was built for Classic Dirt Bike magazine.